This issue will help college leaders inform themselves about legal issues that threaten institutional stability and effectiveness today. Across the nation, community colleges are being sued with increasing frequency over a variety of issues. Officials are confronted with a multitude of federal statutes and court rulings that have made governance and administration more complex and legalistic than ever before. Special–interest groups, like teachers unions and taxpayers associations, are increasingly involved in governing board elections, creating volatile situations for presidents. Consequently, caution is a watchword among many leaders. This situation does nothing to foster the teamwork that is essential in quality institutions. Community colleges exist in a highly litigious society, and their leaders are confronted with numerous legal issues as they carry out assigned duties. Some of those issues are not new to postsecondary education. Examples include governing board relations, academic freedom and tenure, collective bargaining, and employment issues. Other issues newer to the community college include student rights, codes of conduct, accommodation of disabled students, campus safety, distance education, intellectual property rights, and risk management. Community college leaders must find ways to resolve or mitigate these and other issues if their colleges are to continue providing exemplary services to students. This is the 125th issue of the quarterly higher education journal New Directions for Community Colleges. EDITOR S NOTES (Robert C. Cloud). This chapter describes the contractual nature of the relationship between students and community colleges. The Civil Rights Act of 1964 and the Family Educational Rights and Privacy Act (FERPA) are reviewed. Student codes of conduct are discussed and related to institutional mission and campus safety. The implications of academic and nonacademic misconduct are discussed, and the chapter concludes with a review of the minimum due process rights of students facing suspension or expulsion. This chapter describes the legal requirements with which postsecondary institutions must comply in accommodating disabled students. Section 504 of the Rehabilitation Act of 1973 and the Americans with Disabilities Act (ADA) are discussed. Appropriate terms are defined, and the intent of federal disability legislation is clarified. Federal laws affecting employment issues are identified and reviewed. Affirmative action, discrimination, sexual harassment, supervision, evaluation, and contracts are discussed. The chapter concludes with specific recommendations on employment policies and procedures and good human resource management practices. The three–decade history of collective bargaining in community colleges is reviewed. The chapter focuses on the effects of collective bargaining on college administrations, on trustee accountability, on relationships with local and state governments, on faculty governance, and on academic freedom. The relationship between faculty unions and the American labor movement and the competition among unions for faculty affiliations are both discussed. Finally, the chapter closes with recommended guidelines for the future of collective bargaining in the community colleges. This chapter examines the concepts of academic freedom and tenure. Recent court decisions are cited along with arguments for and against continuation of tenure. The chapter concludes with a discussion on multiyear contracts and mandatory posttenure reviews as alternatives to the traditional tenure system. This chapter provides an overview of copyright and intellectual property law as it relates to education in general and telecommunicated instruction in particular. The chapter includes a review of changing federal law and related policy and concludes with an examination of emerging trends in instructional and intellectual property policies. This chapter provides an overview of community college governing board legal issues, including the authority of the board, rights of individual board members, disclosure of confidential information by board members, orientation and professional development activities, and dysfunctional behavior. The chapter concludes with suggestions for improving board relations and effectiveness. Risk management is defined and discussed in terms of its importance in community college administration. Major strategies in risk management are identified and reviewed. Proper risk management policies and procedures are recommended. 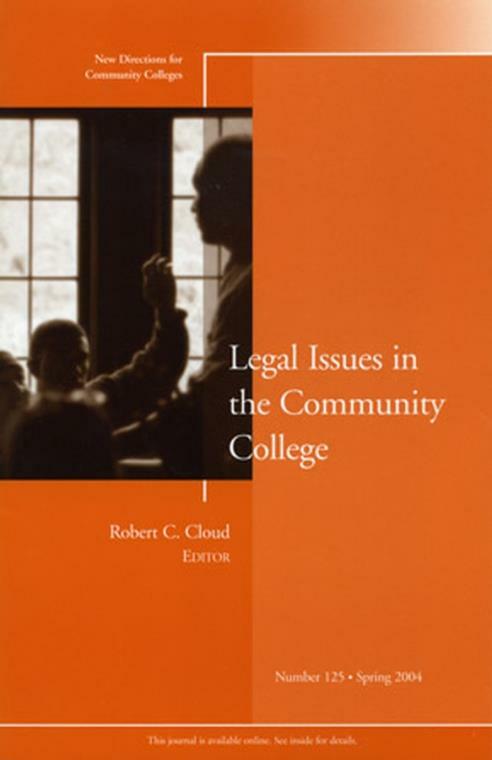 This chapter provides an annotated bibliography of key resources on legal issues in the community colleges.